Quite often, if the wind is blowing in the right direction, I can just about hear the bells of the parish church ringing on a Tuesday evening and I always love that sound. So it was a pleasure to be invited to join the group for an evening and try my hand at bell ringing. 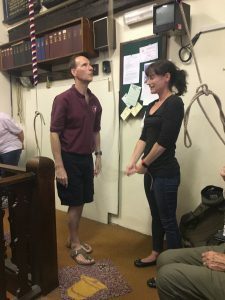 The group meet every Tuesday and start their practice at 8pm although it’s wise to turn up a little beforehand. I entered the belfry and went up through a trap door in the floor and was given a warm welcome by everyone. The group is very diverse, from young to old with a complete mix of abilities. 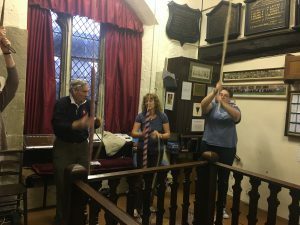 I did once have a go on a portable set of bells that are often found at the local fairs and fêtes in the area but this was a completely different experience. I had expected for some reason to be able to see the actual bells themselves but it was explained that if there were no sound proofing then we would all be deafened! 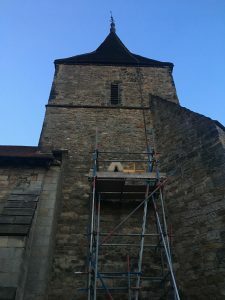 Our parish church has eight bells ranging in tone and each Tuesday ringers from bell towers in neighbouring towns, villages as well as local residents turn up to ring. 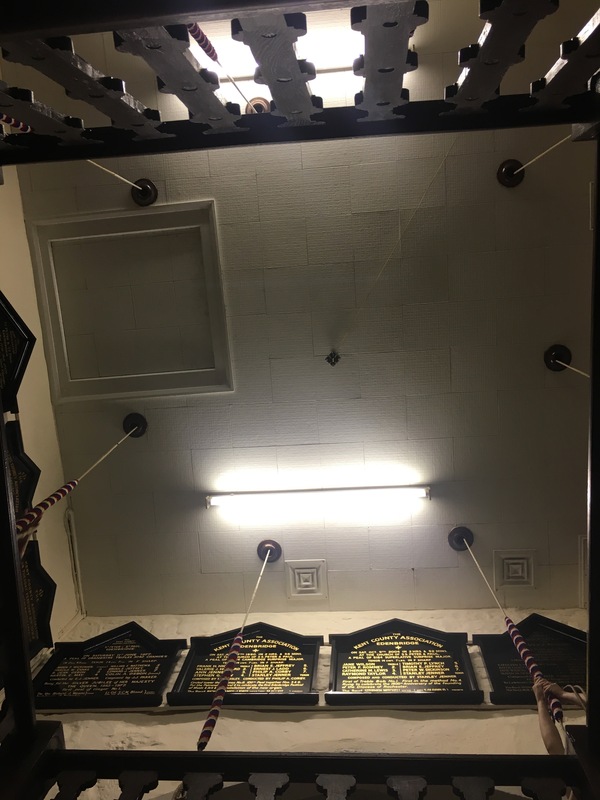 Our bells are considered to be one of the finest sets in Kent. The first thing I was taught was to keep my feet flat on the floor otherwise I could get caught up in one of the ropes. Before I was let loose on the end of the rope, experienced ringer Ian explained the dynamics using a small model of a bell so I could understand the process involved. Just sitting to one side and listening to the ringing was a very pleasurable experience. Still, as I always say, the best way to experience something is give it a go first hand so I had Richard Dyson show me the ropes. I quickly learned that it is no where near as easy as it looks either. You do not have to be strong to ring the bells, even the heaviest which weighs just over 14cwt. It’s all about the movement and if you’re not careful it actually is possible to go shooting up to the ceiling on the end of a rope. I was told that learning to ring the bells is like learning to drive a car – some can get the hang of it very quickly while for others it may take longer. Once you can ring though you would be welcome at any bell tower. The band that rings them also rings for Sunday services, weddings and other special events. The group welcome anyone who would like to give it a go to come along and join them on a Tuesday evening. You don’t need to have a music background either. To find out more contact Richard on 01732 860 234 or email richarddyson2014@gmail.com. You can view a couple of videos from my visit by clicking here.